The Stitchers, especially Elaine, who we primarily worked with, were friendly and knowledgeable. She was extremely easy to work with and quick to answer any questions we had. The self check in feature was wonderful! The house was beautiful and in amazing condition. Everything we needed was provided. The kitchen was fabulous. All images were accurate and the check in and check out processes were very easy. Loved it. Perfect place to relax after adventuring all day. Plenty of room for my family of 5. Elaine, you are amazing. Youre the image of customer service and I am so thankful to you for everything! Every single tiny need we had was met immediately! Happy Pony Place is a dream. I wish that I lived there full time! Elaine has always been above and beyond when it comes to our visits. She and Lance are all about what your experience means to you. If you need or want anything, they will (within normal limits) make it happen. Wonderful people to work with, I never worry about a thing when we book with them. This was our second home rental and we had a wonderful time. We have already booked the third for August! We contacted Elaine regarding some issues in the rental as she was the most recent person who sent us an e-mail about our stay. She was very approachable and empathetic. She also offered us great advise for a local restaurant such as what to order, which we did, and loved it. 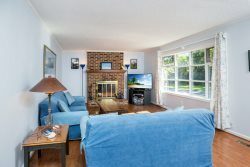 We have rented vacation properties before in beach towns such as Ocean City MD, but this one is the first we would consider renting a second time. the space was comfortable and felt like home. the sun room was where we spent a lot of our time as it offered great sight seeing at all hours of the day. The area was peaceful and offered unique experiences close by. We explored the Wallops Nasa Flight Center, Chincoteague Island, and Berlin. The staff is extremely friendly and hospitable. I would absolutely rent again and look into others properties as well from this company. Elaine was responsive and super helpful with recommendations! We plan on coming back for another vacation and will absolutely used seaside vacations again. We have already referred out the exact house we stayed in to others. Property was great. Loved the location to playground, which the kids loved. Very friendly and quick at answering. Made the stay stress-free! We had a fantastic time at Teal Point. The house was absolutely gorgeous, and we would have gladly moved in! Some windows and doors were a little difficult to unlock/lock but that is to be expected in a house on the water. Everything went very smoothly when I rented Ariel's Grotto. The follow-up is a nice touch. Ariel's Grotto is a wonderful house. It is light and airy inside. It was immaculately clean! It had plenty of dishes, silverware, pots and pans, and cooking utensils. The screened-in back porch was very nice and the front porch was nice. I have booked houses with Lance and Elaine twice and have found them to be fantastic to work with. Their communication is lightening fast and they go above and beyond to make sure your experience is wonderful. I highly recommend Seaside Vacations if you are looking for a rental. It is obvious they love what they do! This property is amazing! Pictures don't do it justice. It is well-appointed, comfortable, and clean. The views are stunning. We saw bald eagles, deer swimming, a huge flock of Ibises roost in the trees, herons, egrets, cranes, ducks, cormorants...the list goes on and on, all from the comfort of those plush chairs parked in front of the floor to ceiling windows. We loved the seaside charm of this historic home. The space was perfect for my two sisters and our parents to relax and enjoy one another's company. We were close to head out for activities. We always made it back in the evening to enjoy the magnificent sunsets from the porch with a glass of wine! They were friendly, responsive and helpful.